Miss Cammie lives in prison. Why? 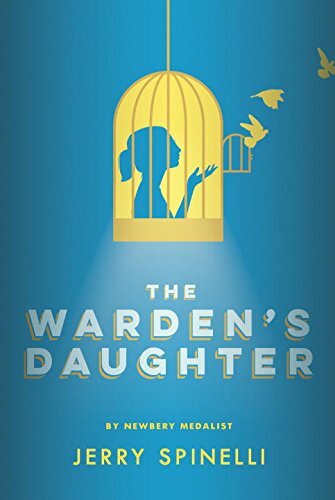 She is in the unusual position of being the warden's daughter. He is occupied a lot of the time running the prison, so he has hired one of the more trustworthy inmates, Eloda, to be her "trustee," keeping house and trying to keep Cammie out of trouble. And Cammie is in a lot of trouble. She is angry because she is motherless. Her own mother saved her from getting run over by a milk truck when she was a baby, but got killed herself. Cammie screams at the brats who have mothers and don't appreciate. She snaps at her friends and slugs her admirers. But she has figured out the perfect mother to take her own mother's place: her project begins to turn Eloda into something more. I have to say, Jerry Spinelli has been a perennial favorite of mine since meeting Star Girl. His progression from his first book, Space Station Seventh Grade, to The Warden's Daughter is pretty impressive. Both of them hung on an idea and while The Warden's Daughter had the potential hazard of remaining interesting in the abstract sense only, it was thoroughly engaging because of its compelling characters. I didn't realize how engaged I was until I reached the ending, which was a tear-jerker. The whole thing felt so real. Not just the characters, but also the whole setting which took place in Two Mills, Pennsylvania, 1959. References to "Spootnik, scrapple, Bandstand," all things I had never personally experienced, brought the action alive. I could imagine going down to the Scooper Dooper and ordering myself a banana split with four cherries. Because there is a lot of anger and disappointment, as well as one scene that is discreet but serious, this book seems to be geared more for the mature middle reader. But not to worry, in the tradition of most kid's literature, there is a happy ending. Despite the tears.